As seen on the news today a large salt storage barn (150ft x 80ft) behind the Irondequoit Town Hall went up in flames today around 3:20pm. The fire was actually in the Point Pleasant fire district which brought fire equipment from Point Pleasant, St. Paul and Ridge Culver to the scene immediately. 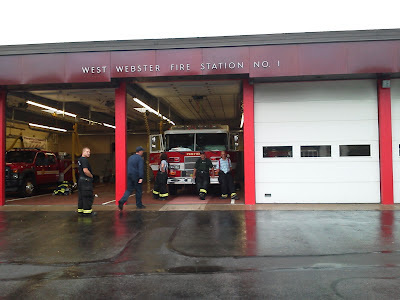 As more equipment was called upon it brought Laurelton, Sea Breeze, and West Webster to the scene while moving Webster up to provide coverage for one of the Irondequoit companies. Eventually so much equipment was drawn from West Webster that an engine was called from Penfield to back fill West Webster. Penfield's engine was out for about 2 hours providing coverage.